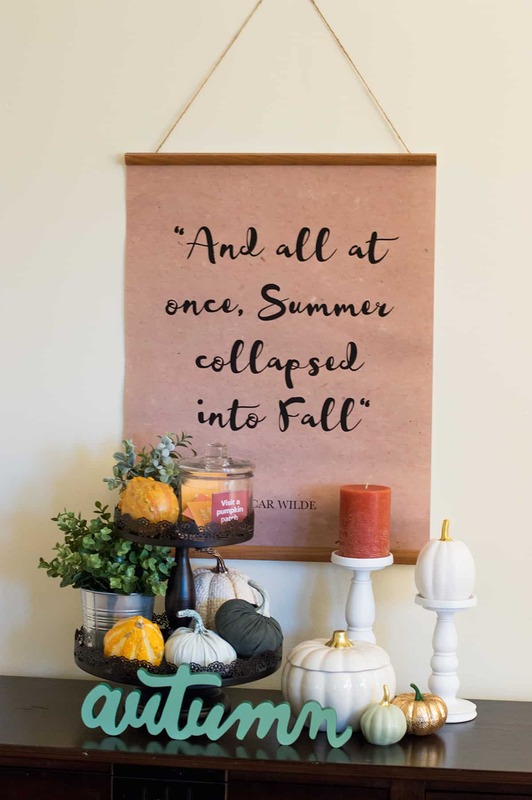 Oh Fall, you have been lovely lately! I’ve been waiting for the chance to throw on my sweaters and pull on my boots and hit the apple orchard and enjoy the cool air. My family checked off a couple of of activities from our Fall family bucket list this week: attend a Fall festival and enjoy a bonfire and make some s’mores. I’ve been waiting for the chance to throw on my sweaters and pull on my boots and hit the apple orchard and enjoy the cool air. 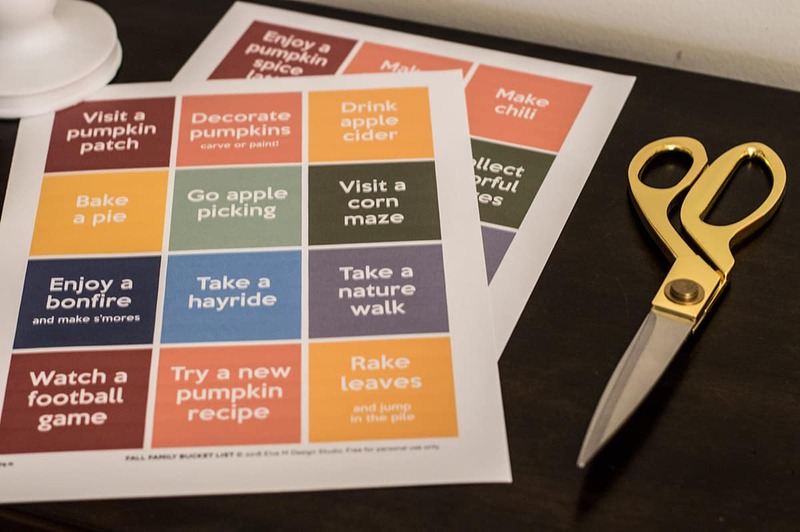 Every year, I love to put fun Fall activities on the calendar but this year I created a fun printable that the kids will love to participate in. 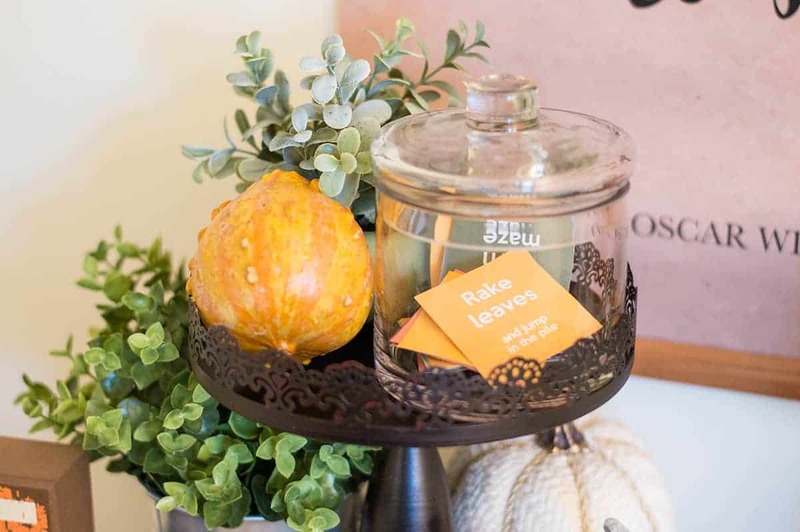 I made a set of cards that include all of our Fall favorites, printed them out, cut ’em out, and put them in a cute little jar on a Fall display on our console table. 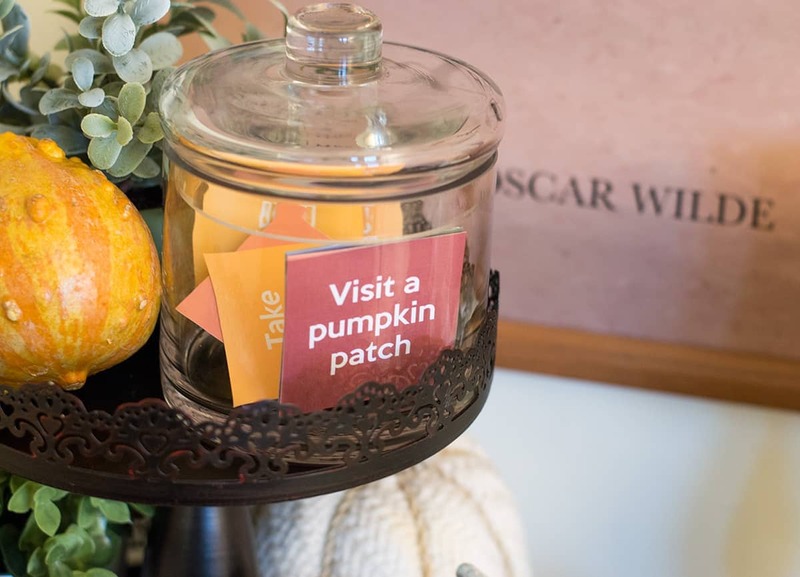 Whenever we are looking for a Fall activity, we can choose a card. You can download this set for your own use at the bottom of the post! 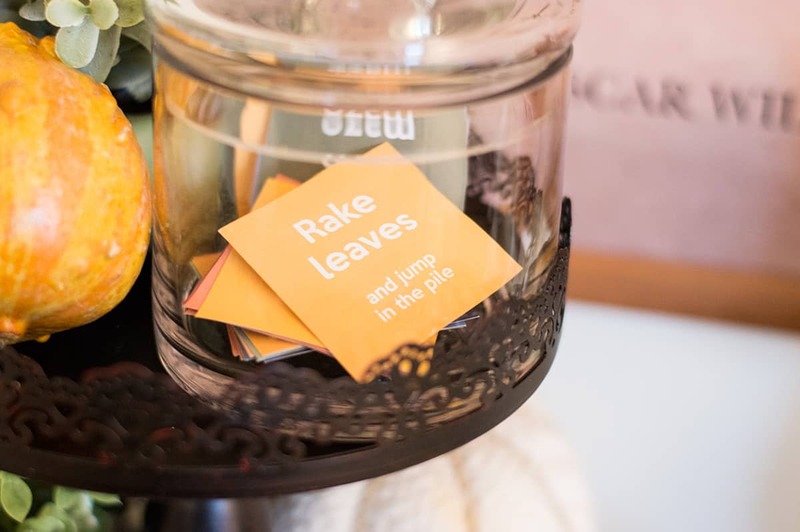 The little cards are displayed in a glass jar on one of my tiered trays that I styled on our living room console table. See that scroll banner hanging behind the tiered stand? I made that! 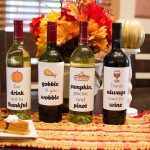 You can too with the tutorial and the free printable. 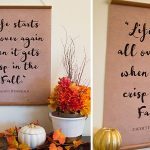 Check out my DIY Fall Quote Banners. 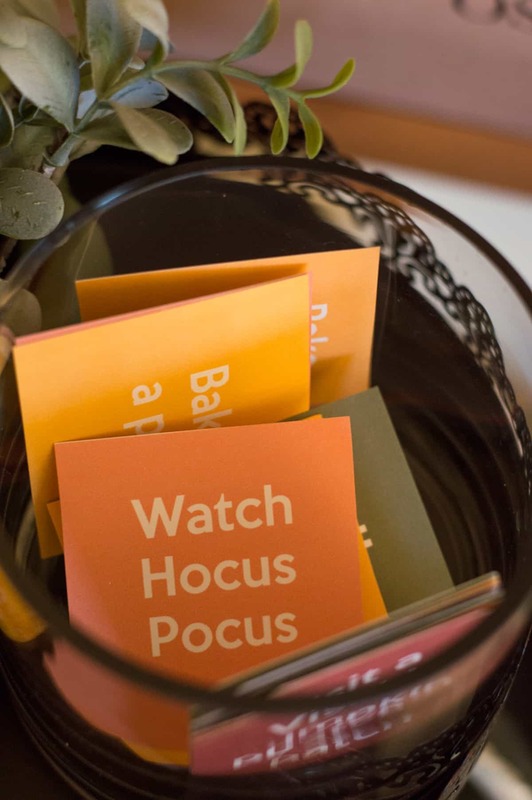 Of course Hocus Pocus made the list! 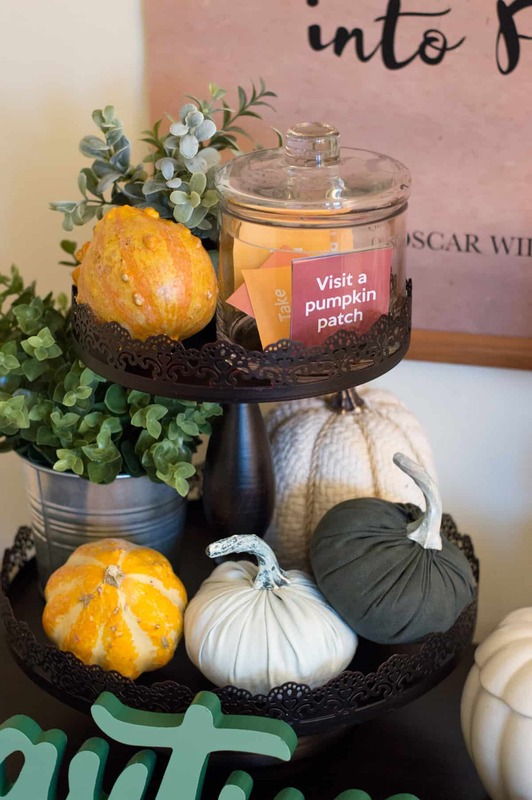 I love the cute fabric pumpkins I picked up from the Target dollar spot to style my tiered tray with. Target gets me every time with their seasonal decor. 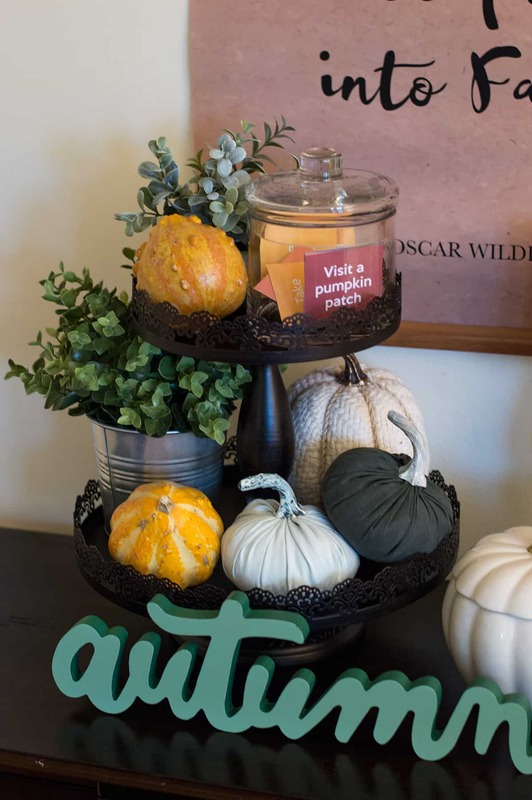 I added in some real gourds and a couple of faux plants. I love the greenery against the white, orange, and sage green colors. The printable cards have a complementary color scheme and I love the final look! 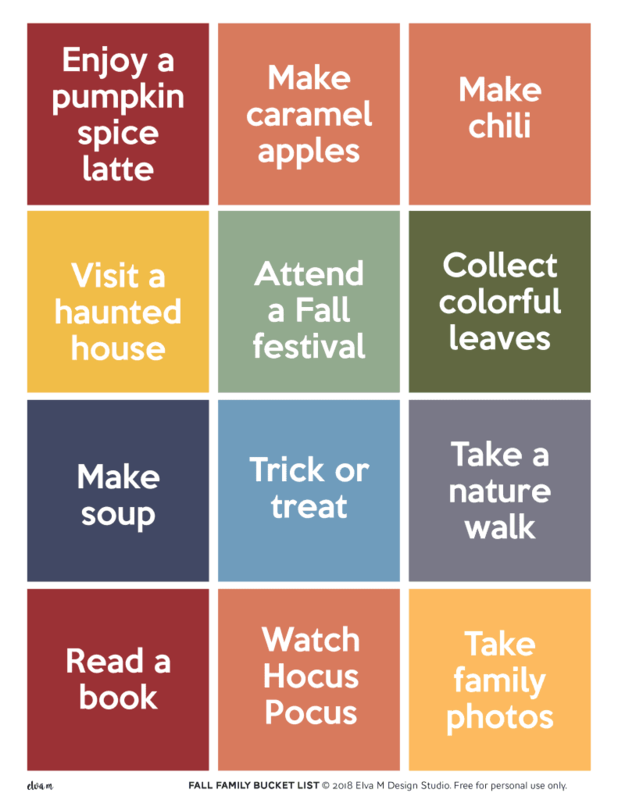 I’ve included a lot of fun activities in this Fall Family Bucket List. Which ones are your favorite? Any missing? Tell me in the comments below! 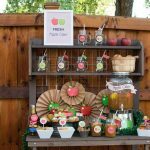 If you’re planning to enjoy some apple cider you might love to see how I styled an Apple Cider Bar and then go grab the free apple cider bar printables. 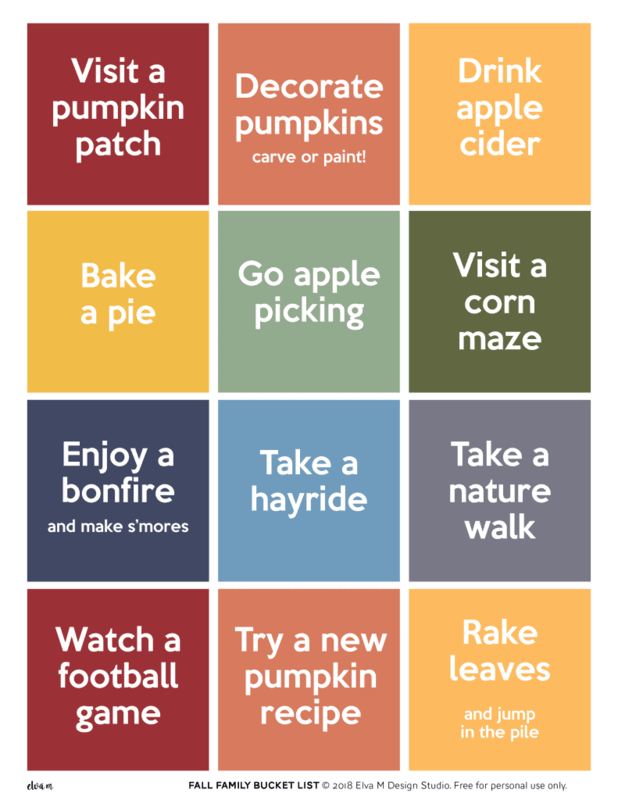 I hope you have a fun Fall season with this Fall Family Bucket List! 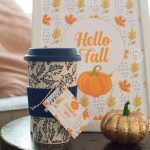 I’ll be sharing more ideas and freebies all season long so be sure to check back soon! I love fall activities!! Hoping to get in a few more in Stillwater this weekend!